– Who will be responsible for customer feedback management? – How will we be notified of new feedback? – How will we involve the customer in the feedback process? Evidently, you cannot hunt for gold nuggets just anywhere. 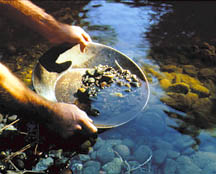 You can be sure that a gold panning professional has done his research in advance to determine the ideal gold panning locations. Organizations should do their homework too. Today, there are many opportunities for organizations to collect and organize feedback from a multitude of different channels. Therefore, it is imperative to know where your customers are – so you can capture those “golden nuggets” of insight. Want to turn your own customer feedback into product gold? Tune in to our weekly webinars to find out how.